Mixed (7,998) - 45% of the 7,998 user reviews in the last 30 days are positive. Mixed (828,605) - 49% of the 828,605 user reviews for this game are positive. Group 6 of the Twitch streamer skins are here, featuring two of the most demanded personalities to ever join the Battle Royale, chocoTaco and WackyJacky101! 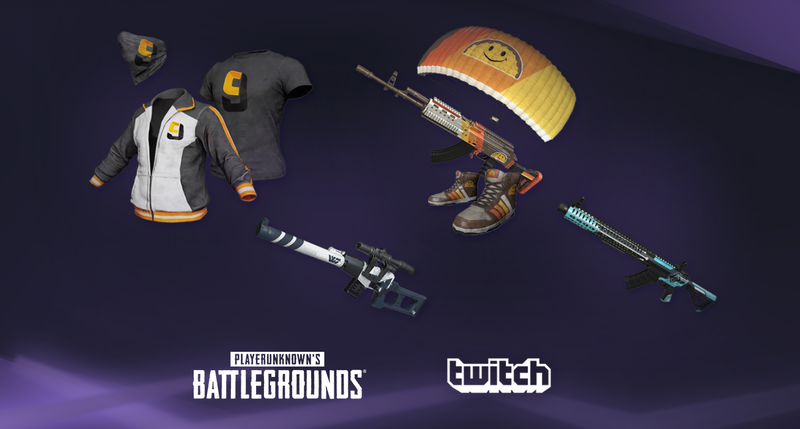 Because you demanded it, this group of items includes the first ever Broadcaster Royale Parachute skin for chocoTaco! Skins are available for between $2.99-$9.99 each and can be purchased until May 14th, 2019 PST before the server maintenance starts. through the game client. Each sale directly benefits the Twitch streamer, so pick up your favorite skins and support them in-game and out! Viewers looking to support their favorite streamers can click the #BroadcasterRoyale menu in the in-game store to purchase and see all streamer items available. Update #28 is now available on live servers. Update #28 brings weapon progression to PUBG in the form of Weapon Mastery, a new batch of Broadcaster Royale skins and the awaited loot increase we promised on Erangel. You can get all of the details on Weapon Mastery in our recent Dev Letter, Introducing: Weapon Mastery. For more information on what was fixed, tweaked and added, read our detailed Patch Update #28 Notes. Patch #28 debuts Weapon Mastery to the world. Get complete stats and cool charms for your entire arsenal as you build up your skill level on each of PUBG’s signature guns. You’ll want to dive into Weapon Mastery here to discover all of the ways you can earn medals, charms and, of course, bragging rights. The much demanded chocoTaco skins are now available as part of Broadcaster Royale Group 6. SHROUD, WackJacky and more also debut new items and cosmetics so you can drop onto the Battlegrounds in style. Read about all of the new Broadcast Royale looks here. As promised as part of the rebalance of Erangel, there is now a lot more to be looted on the original Battlegrounds map. Jump into the game now to find your gun, gear and your next target. We can't wait to hear your feedback! Enjoy the update. 1,593 Curators have reviewed this product. Click here to see them.